Everyone could use a little grounding in their life. You may be unfamiliar with the term grounding or earthing, but it is nothing to shy away from! Grounding is a natural way to ease the stress in your life, as well as improve sleep by using--that’s right--the very ground we stand on! Our bodies were meant to come in contact with the earth daily, at least, but the more times per day- the better! Throughout the years, we have gradually spent less and less time outdoors. Between long hours at work behind our computers, the day-to-day chores associated with owning vehicles and homes, over-stimulation with our various electronic devices, and easily accessible entertainment right from our couch, it has become increasingly difficult to enjoy our leisure time outside. Also, we usually will find tiles, carpet, wood and other synthetic floorings in homes and work spaces, that replace the original floors our ancestors walked on- the earth in its purest form. The easiest way to practice “grounding” or “earthing” is to take your shoes off and head out to an area where your bare feet will be in contact with rocks, dirt, water, or sand. Some of the best places to ground your body are at the beach, a stone pond, or hiking trail. You might even have the perfect grounding spot in your front garden or back yard! It’s as easy as it sounds! Take in the smells and sounds around you, feel the earth below you and make sure you relax. Relaxation is essential to receive all of the benefits of the earth, and the electrodes from the ground. The key is to spend enough time outside daily barefoot. Grounding once a day for 30-60 minutes is ideal! The more time you spend barefoot outdoors, the better! This is not all woo-woo either- there is scientific evidence of the benefits of grounding. Emerging studies have shown that the electrical energy in our bodies balance out with the electrons in the earth, equalizing and, in turn, reducing inflammation and chronic pain, every time you ground! Plus we can't overlook how good it is for our soul to spend time out in the sun, fresh air and to experience green spaces and nature. Grounding really is as easy as heading out barefoot or taking a walk on the beach. I make a point of always taking off my shoes and sinking my feet into the dirt or grass any time I am outside at the park, or even just in my front garden. Grounding is the most natural way to balance out the energy in your body and feel less stressed while feeling at one with the earth. I encourage you to make this a part of your self-care routine to get your feet on the earth next time you take a break from your laptop and get outside. Want to learn more ways to live a healthy lifestyle so yoou can be on top of your game in biz and life? Let's work together! 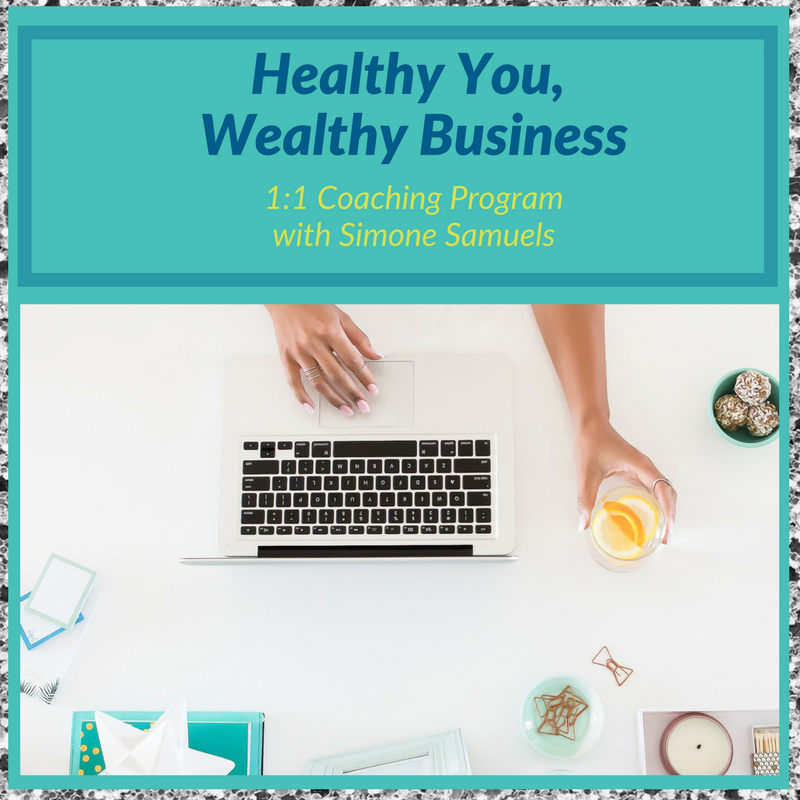 My 1:1 Healthy You, Wealthy Business coaching program includes an impactful 90-minute judgement-free session.